Make a run on HQ. 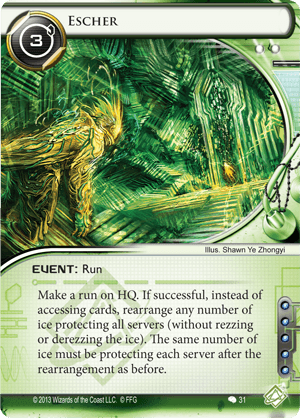 If successful, instead of accessing cards, rearrange any number of ice protecting all servers (without rezzing or derezzing the ice). The same number of ice must be protecting each server after the rearrangement as before. There are already two good reviews for this card here, but I think there is another relevant combo card that is worth mentioning. Escher can set up a great server for Atman to run through. While corps try to address Atman at the deckbuilding stage, a lot of their favorite ICE still line up at strength 3 or 4 (Eli 1.0, Ichi 1.0, Lotus Field and Data Raven/Architect, Wall of Static, and Caduceus). It is very possible to see 3-4 of these ICE rezzed by late game, and stack a nice set on R&D for some cheap access runs, or blow through a scoring remote for just a few credits. Also, since Atman is an AI breaker, it is worth mentioning that you can further dump the AI-hate ICE (Wraparound, Turing and Swordsman) onto unimportant servers and clear the way for your AI suite, which is more of a mid-game move. If this card were 3 influence, I'd use it in my Noise Faust deck. This card takes advantage of this order of importance. Stay off HQ for most of the game (unless it's wide open). Focus on R+D and remotes until they become difficult to access. Wait for your opponent to set up what seems like a scoring window. Then you play Escher. And the game changes. The exact advantages depend on the game. Maybe you put all the code gates in one server for Cyber Cypher or Gordian Blade to smack down. Maybe you line up all of the non etr ice on a vulnerable server. Maybe you put that Tollbooth on Archives. Maybe you switch the places of Crick and Turing. This card wins games. It's a 1x, as x3r0h0ur mentions, but it should seriously be almost an auto-include in any Shaper deck. You won't need it some games, true. But when you do need it, it helps you like no other card can. Clearly kit loves this card. Most shapers can benefit though because most breakers maintain strength, and the cost savings is definitely there, even after the HQ run and 3. Allowing shapers to do what they do best, hammer RnD, for cheap, is a very good thing. The 5 influence makes it nearly impossible to splash except maybe for Tenma. I'll leave that alone for this review. In shaper, particularly the popular Calimsha Kate, one of the best ways to hose the deck is to spread code gates to beat cy-cy, or to stack barriers to overtax recursion for lady. This lets you unstack barriers, move codegates out of the way and stick something normal in front of a code gate spread, and just generally make runs as efficient as possible. Generally this is a 1 of in any deck running it, since you never want it early, and you probably don't want two. It is a lot like vamp where its either a blow out, or useless. Very few Eschers are dry fires due to play decision making. Hopefully this seems more play as glacier comes back into the meta.